I've been feeling this for awhile, but I've feared confessing will bring animosity to my name. Serendipitously, "Wedding Planner" was on at the gym Saturday morning, reinforcing my decision to confess. I don't want to plan a wedding. Every little girl dreams of her wedding her entire life, right? Not me. I have planned more parties and events than I could even attempt to count. I even plan events for a living. Event planning = stress/work. If I'm planning a party, like my annual "A Christmas Story" pajama party, no one expects anything other than friends, free food, and a good movie. If the ***t hits the fan, oh well! Expectations are, oh, just a little different for a wedding. What do I want for my wedding, you ask? I want a groom. That's a given. And I want a pretty dress. I could care less about all of the pomp and circumstance...I don't even like cake! I seriously might break down with an anxiety attack. If someone wants to pay for a wedding planner and have them do all of it? Great, I'm all over it, but I certainly can't afford to pay for that kind of arrangement. Friends and parents on both sides will surely not be okay with my lack of desire for wedding day party "bliss." I would be all over an informal gathering at a later date for celebrating, however, I will surely be a part of planning some elaborate event that will stress me to the max and taint what everyone builds up to be the "best day of your life." If I have a groom that is NID (not into details), well, he better start getting ID (into details) quickly or he will find himself lacking a bride - I can almost guarantee I'm as uninterested as him. The bride traditionally plans things because she's the one who cares. And I don't. The whole thing wreaks of stress. In college I planned my funeral simply because I thought it was as silly as wedding planning. Wedding planning is as hard or as easy as you want to make it. My DH and I nixed a lot of the pomp and circumstance simply because we didn't care or didn't have enough energy or money for the effort. The absence of a few things (like cutting the cake) confused a few guests, but, hey, I'm pretty certain that my marriage is still legitimate and legal so it's all good. I agree that your wedding is all about what represents you. So in any fashion you want it to be. Whether small or large. Line or dance. Heck, I just want to have a party with lots of dancing. And if I make it over to say hello to you, then I do. No pressure :)I say, do whatever you want. Or not do it. And if you want help, I will help. Cause whatever kind of celebration there is to toast the fact that some one was lucky enough to nail you down for eternity... is going to be b*tchin! PS that dress is beautiful. 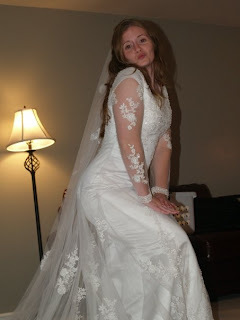 I did a less formal affair and I still hated all the planning and stress and money. Weddings are ridiculous. Just remember, the reception is for the bride's mother. When the day comes, the bride and groom could care less, for some reason, they have other things going through their heads. The mother, on the other hand, wants to show her daughter off to the world. So, the best thing to do, give the planning to your mom, let her go crazy with the details. One good thing about all the hoop la. A reception is the one time (besides a funeral) when all the people from all the different episodes of your life come to see you.